Goodman Fielder is focused on ensuring our consumers have the best experience possible with our products. We are committed to delivering safe, quality products for our customers and consumers every time. Goodman Fielder continues to work hard to build a quality focused culture across the entire business. Quality is one of our key business imperatives and is recognised as a priority at all levels of the organisation. Our approach focuses on ensuring quality for our customers and consumers and we track numerous quality performance indicators, with the number of consumer complaints being a good indicator of whether we are getting it right the first time. A 20% decrease in consumer complaints in 2017 indicates that we are making a difference across all areas of our business. 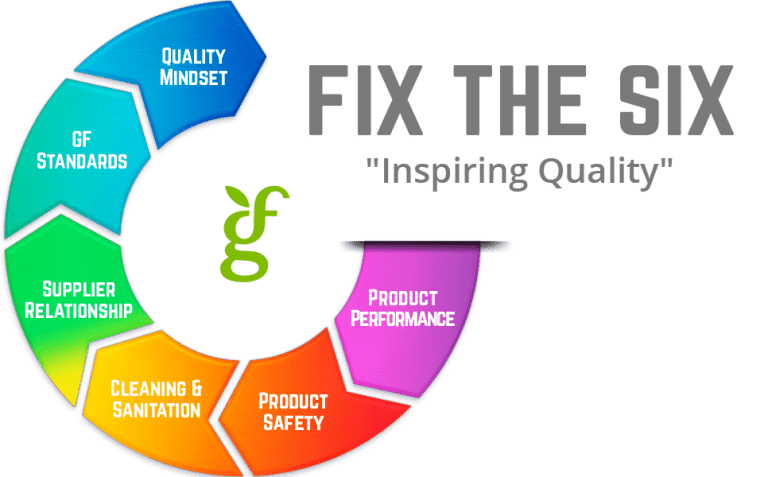 Goodman Fielder holds six strategic imperatives in quality, which can be seen in the diagram below. The focus on building quality leadership in Goodman Fielder is helping drive increased engagement in our Quality team. Our Business and Site Quality Teams manage the site Quality programs and are also responsible for the management of suppliers and external manufacturers in their region. We want to ensure the Goodman Fielder quality journey is shared across the supply chain, driving shared quality standards from paddock to plate. As well as building shared quality plans with critical suppliers, we also measure complaints for our external manufacturers as a quality performance indicator. Our efforts are making a difference and driving a decrease in consumer complaints.